Despite earlier reports, Electronic Arts says nobody is talking to Richard Garriott about a new Ultima game. Richard Garriott revealed earlier this week that he's begun work on a new project, the creatively-named "Ultimate RPG," and that it could quite literally become Ultima Online 2. 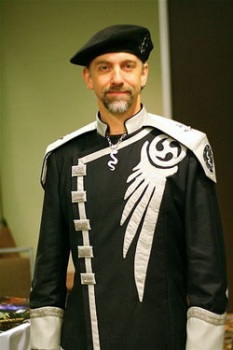 "We've actually talked to Electronic Arts about [Garriott leading Ultima Online again]. I would love to have access to the Ultima property. We've had discussions at very high levels with Electronic Arts about access to the property," he said. "We're in discussions with Electronic Arts even now about a possible marketing and distribution relationships and things of this nature." But the hope for a new Ultima currently faces one major stumbling block: EA doesn't appear to know anything about it. "I'm not sure what Richard Garriott is referring to," Jeff Brown, EA's head of corporate communications, told IndustryGamers. "But no one at EA is discussing partnership or licensing opportunities related to the Ultima Online franchise." That led to some fast-talking clarification from a Garriott rep. "Richard is not CURRENTLY having conversations at high levels with Electronic Arts regarding the Ultima franchise. He never said that he is. I can assure you, however, that those conversations have taken place in the past," he said. "What is taking place right now are conversations with EA as well as other companies regarding potential partnerships/distribution deals involving our other products including Ultimate Collector and our Casino games, Port Casino Poker and Port Casino Blackjack," he continued. "These are normal and expected communications taking place as we move closer to launching Ultimate Collector sometime after the first of the year." That's a fine hair to split, although in the grand scheme of things it's not worth getting too worked up about; it's not like Garriott is selling weapons to Iran to finance Nicaraguan insurgents, after all. But it is kind of a shame that a new Ultima from the man who started it all may not be quite as close to hand as we though.